My kids both loved the book Deadly Feathers by Des Hunt, I actually really enjoyed it too, made me want to go to Stewart Island. We loved reading about the kākāpō and Sirocco the Rock Star Kākāpō. The other thing we all love is a nature programme so I thought I would check out New Zealand Geographic TV. There is a huge selection from old classics like the Wild South series in the 80s to international series like Living World. 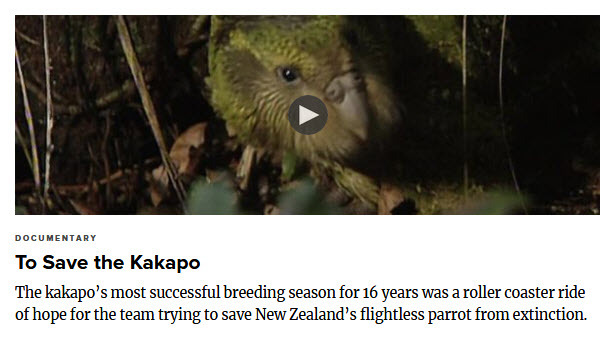 I found a programme called To Save the Kākāpō that was filmed in 1997 when there were only about 50 kākāpō left and follows the very rare breeding season of the kākāpō. To Save the Kākāpō is filmed the year Sirocco hatched so is actually quite fascinating the lengths the volunteers went to help the kākāpō chicks. The kākāpō only breeds when the rimu trees fruit, which is once every 2 to 4 years. This summer is expected to be another breeding season, even a bumper one, so hopefully they can increase the population from the current 154.